It’s a new year—a new start–a new you! I know you might get sick of making New Year’s Resolutions and then not sticking to them, but HEY— Don’t be so hard on yourself! Maybe you are setting yourself up for failure? 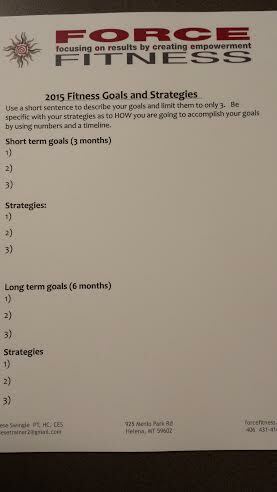 Here’s a very SIMPLE way to make SIMPLE goals and strategies that will help you adhere a little easier. Feel free to print out the form and TAPE it to your mirror where you can look at it daily! Remember, baby steps lead to giant accomplishments. Make your goals realistic and measurable. Measure your chest, bicep, waist, hips and thigh at the widest part of your dominant side. Weigh yourself daily (not to judge yourself, but to guide you and keep you on track). ← T'was the Eve before New Year's…..